The 37th Wicklow 200 to be held on June 10th. As 2017 heads to a conclusion, riders are already making plans for the up-coming season with confirmation of the date of the next edition of the Wicklow 200. Event organisers have confirmed that Wicklow 200 and Wicklow 100 will take place on Sunday June 10th 2018. Entering it's 37th year, the IVCA run event is a firmly established and much-loved feature on the cycling calendar and serves as the training focus for serious cyclists. 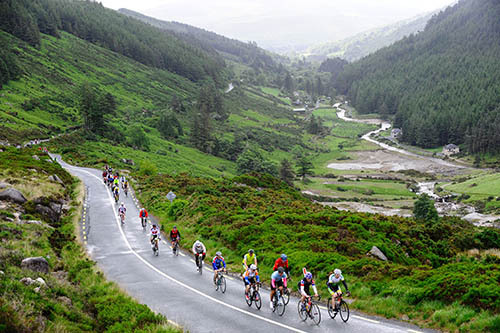 The 200km challenge ride around the Garden County of Ireland and its 100km sibling Wicklow 100 are among Ireland’s most popular annual sports events with more than 3000 people taking part in the fully-subscribed event this year. Registration opens Wednesday, November 1st when entrants will be able to benefit from an 'early bird' discount price. "Last year's event was over subscribed so we recommend that riders get their entries in early to avoid disappointment," says event organiser Alan Heary. "There's an extra incentive in the form of the early bird discount, not to mention the knowledge that your goal has been set and you can focus fully on getting the winter base miles in with a clear objective in mind." Beginning in 1982, the Wicklow 200 has been organised annually by the Irish Veteran Cyclists Association (I.V.C.A.) and serves as a major fundraising event for cycling in Ireland. Approximately 200 volunteers will provide first aid, mechanical breakdown, route marshalling, car parking, changing rooms, showers, and refreshment stops. Registration for the 2018 event will open on November 1, 2017.